Ovid (Publius Ovidius Naso) was a Roman poet who lived from 43 B.C. – 17 A.D. His most famous work, Metamorphoses, is a poetic narrative of Greek myths, celebrating the themes of transformation and change. 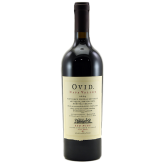 Each year, winemakers Andy Erickson and Austin Peterson produce wine from small lots of fruit grown in the red rocky soil of the Ovid vineyard on Pritchard Hill, age it in the best barrels and blend to create Ovid Napa Valley. Each vintage incorporates the Bordeaux varietals Cabernet Sauvignon, Cabernet Franc, Merlot and Petit Verdot, varying in proportion from year to year but always conveying a sense of this special region.